Save Big to buy Three Sets together. 1) Total of 16 pieces Hobby knife set. 3 handles and 13 knives in this convenient plastic yellow case. Metal chucks hold the blades very well. 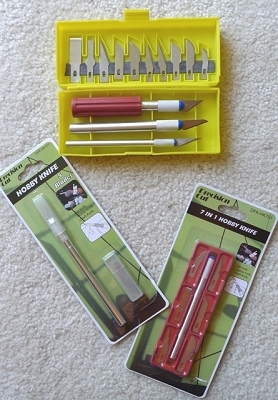 2)7 In 1 Hobby Knife Set 3)5 Blades Knife Set Precision Cut, not the Exacto brand.